Creating luxury earth-friendly cleaning burning coconut wax candles, Cocolux have definitely raised the bar in the scented candle market. This unconventional and emerging brand founded in Australia, gained inspiration from the stunning Australian Coastline to create indulgent scents that effortlessly transport you to paradise. Impeccably designed these candles are made from organic coconut wax taken from coconut flesh combined with beeswax creating a blend which is sustainable, long lasting and clean burning. Now available globally, we were in awe of their innovative approach and unique blends and had to find out more. What sets your brand apart from other luxury candle manufacturers? Our candles are made with high quality fragrances infused in earth-friendly clean burning coconut oil. We are proud to say we don’t use any paraffin, palm or soy in our candles. Our coconut wax candles burn 20% longer than candles of the same wax volume that are made with soy, paraffin or palm oil. What is the most important stage of your production process? I am not sure if one process is more important than another. We are really invested in all stages of production to ensure the quality is of the highest standard. Every one of our suppliers is required to be focused on producing the best possible quality. Our brass and copper is handcrafted in India with a leading manufacturer, our coconut oil is a product that is normally used for food consumption which we import directly from Malaysia. Our fragrances are our own blends, carefully mixed in-house, poured and packaged at our manufacturing facility in Australia. Perhaps the most important part of the process is the final quality checks to ensure it meets our standards before being shipped out to our customers. What scent in your collection do you think is the most versatile and why? Island Fig, Cassis and Peach or our Tonka Bean & Lime Zest. Both scents are all round strong sellers and loved by both men and women. Drop in Refills: For our Copper & Brass 225 g / 7.9 oz & 350 g / 12.3 oz vessels. Watch out for the launch of our drop in candle refills for our 225g and 350g size candles in October this year, beautifully packaged in true style our refills will be available in all 10 fragrances. Customers will be able to purchase refills and re-use their copper or brass vessels at a fraction of the cost of buying a new candle. A modern alternative for room diffuser using ultra-absorbent lava rock infused with a choice of our 10 scents. Lava rocks and vessel come with a 30ml eye-dropper bottle of concentrate scented refresher oil to keep the scent flowing. Choose from two different vessels, our LUNA in brass with sandblasted black iron or SOL vessel with copper with sandblasted white iron vessel. What is your top three recommendations for choosing a scent this summer? When selecting a scent you need to work out where you want to be transported to. Think an island escape, a rain forest or a tropical paradise and then select a scent that will take you there. WILD FRANGIPANI – Wistful and nostalgic, our wild frangipani scent is derived from a unique essential oil blend. Rich and true to this summer flower, this evocative scent will transport you to a tropical paradise. Think about when you want to burn your candle, for example after mealtimes, while entertaining guests or to wind down & relax or to create an oasis at home. Select a scent that will suit your purpose. COCONUT, GINGER & POMELO – Bursting with bright citrus tones, this summer scent combines fresh ginger and green tea to transport you to a tropical island destination. Topped with sweet pomelo grapefruit and coconut palm, this unique blend is perfect for when you want to relax and unwind, dreaming of a sweet summer sun. When entertaining this summer select a scent that is going to represent your style, home or the theme for your summer soiree. ISLAND FIG, CASSIS & PEACH – SCENT: A homely scent incorporating sun warmed figs, delicate cassis, cedarwood and hyacinth. With deep fruits and strong spice at its heart, burn before mealtimes and when entertaining guests. With style, quality & purpose our focus, we just don’t stop when it comes to product improvement. We have evolved a lot since launching two and half years ago. When we first launched the brand we only offered 6 fragrances in copper, we now have 10 fragrances in our range. We didn’t lacquer our vessels in the beginning so the customer had to polish them with metal cleaners to maintain the shine. Now we lacquer them so the original lustre and shine remains. We have recently introduced a velvet base for our brass and copper candles to protect the surfaces the candle rests on so there is no need to use a coaster if burning on a surface that could be affected by heat. At the beginning of this year we moved copper and brass suppliers to work with an amazing new manufacturer that are leaders in their field. We lifted the quality of our vessels and increased the thickness of the copper and brass to a 20SWG gauge, you can feel the difference in quality. We have also introduced our ONYX stone range of candles available in 3 size candles including a 1.2kg grande candle. For those looking to pack a piece of paradise on their travels our 100g Cruise glass jar candle is a perfect choice for throwing in the luggage. 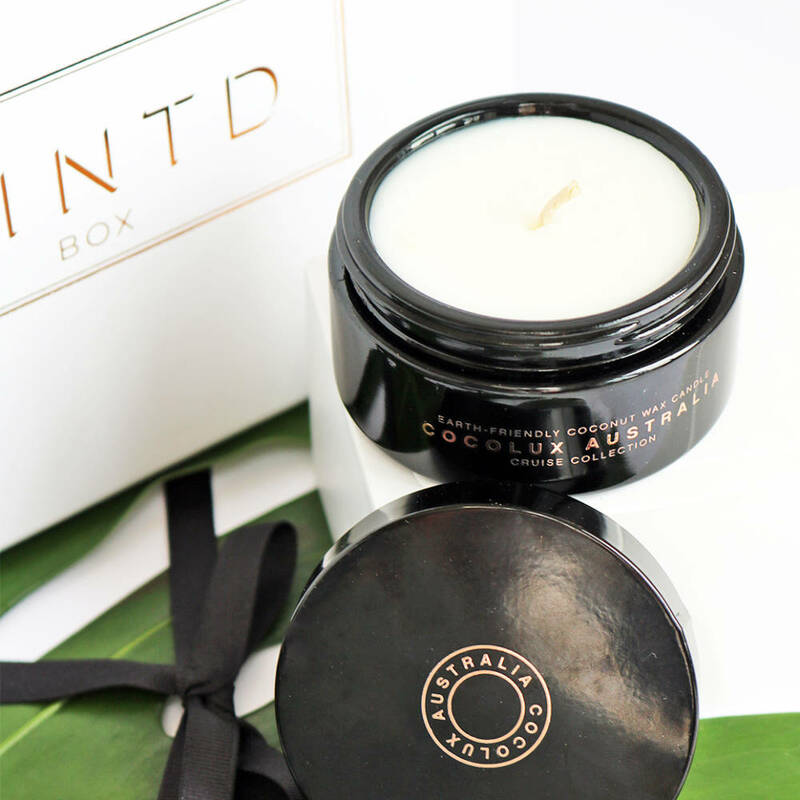 - Made with soft and sweet with zesty citrus top notes, this luxury candle from Cocolux is sourced from Australia and is completely natural and sustainable. It’s clean burning with a pure cotton wick - infused with fragrances to capture the essence of nature.